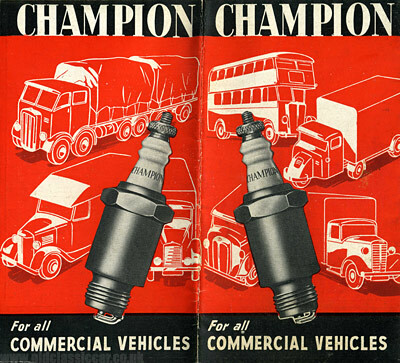 Champion plugs 'for all commercial vehicles'. Homepage. This page: Details of spark plugs recommended for commercial vehicles in the late 1940s. The leaflet shown alongside I think was issued in 1948, detailing the various Champion spark plugs that were available to drivers of British, European and USA-built commercial vehicles. Pocket sized, it folds out into a small chart listing several hundred makes and model of lorry. Some of the British and European makes I've heard of, such as Austin, Crossley, Lister Auto Trucks and Saurer, whereas others I've never heard of, eg Krupp, Multiwheeler, Pagefield and Vomag. The list of American trucks is extensive, with everything from American La France, Corbitt, Duplex and Fargo, through to yet more obscure manufacturers such as Hawkeye, Kelly Springfield, Sanford and Yellow. 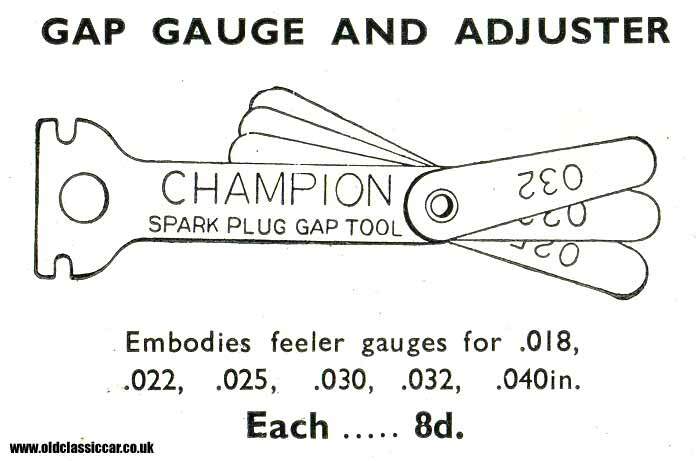 Fold out this pocket-size leaflet, and details of the different style of terminals used on Champion spark plugs is given, as is a diagram showing the Champion-branded gap tool and adjusted that you could buy, for 8d a time. Interestingly there is no mention of the Champion Plugometer, perhaps this was a later gadget. Identifying different types of Champion plug. that the plugs shall not in any circumstances be reconditioned or renovated for re-sale. Any breach of any of the above conditions by any person dealing with Champion plugs will render such person liable to an action for infringement of Letters Patent." Interest in the older style of sparkplug means that there is a band of collectors out there who seek out rare types of plug for their own collections, some of whom advertise in the automobilia section of this site, in the spark plug collecting section. Some advice on how to check the plugs in your car's engine can also be found here. Return to the motoring memorabilia section to read about more oddball, motoring-related, collectables. Included is a look at the Belling-Lee Sparkmaster, an inexpensive gadget designed to improve the performance of a car's ignition system.